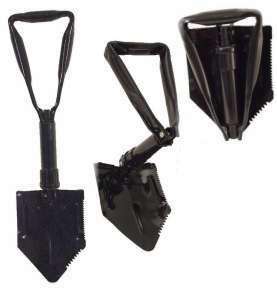 The intrenching tool is intended for digging, breaking hard ground, clearing brush or undergrowth, and cutting roots, saplings, and small trees. The intrenching tool is 9 1/2 inches long when collapsed and about 23 1/2 inches long when fully extended. It has a hollow triangular-shaped handle. One edge of the blade is sharpened for cutting; the other edge is serrated to aid in digging, in addition to serving as a chopping device. The blade can be adjusted into a various positions by loosening the locking nut at the blade end of the handle, adjusting the blade to the desired position, and tightening the locking nut. The intrenching tool interfaces with the nylon carrier and the succeeding EVA carrier. FM 21-15, 1977, pp. 188-189. LP/P DES 21-69, superseded by MIL-I-43684, and then superseded by A-A-59337.